Lt. Col John U.D. 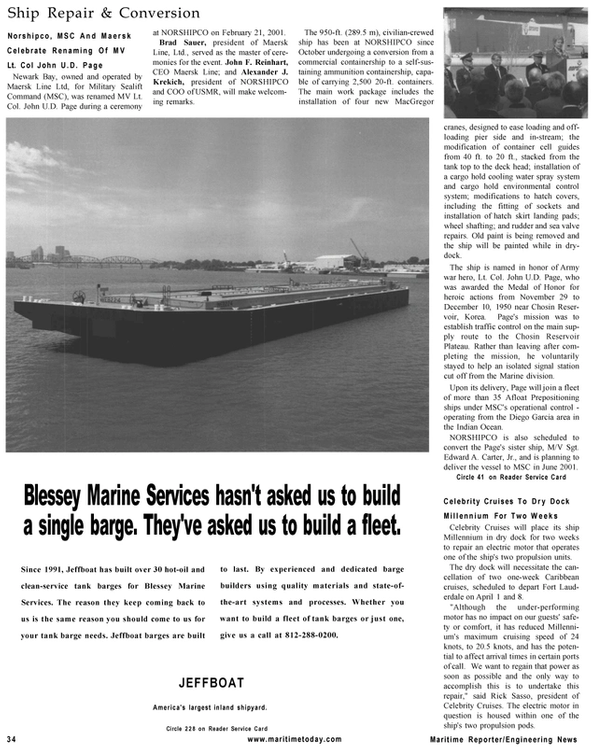 Page Newark Bay, owned and operated by Maersk Line Ltd, for Military Sealift Command (MSC), was renamed MV Lt.
Brad Sauer, president of Maersk Line, Ltd., served as the master of ceremonies for the event. John F. Reinhart, CEO Maersk Line; and Alexander J.
Krekich, president of NORSHIPCO and COO of USMR, will make welcoming remarks. The 950-ft. (289.5 m), civilian-crewed ship has been at NORSHIPCO since October undergoing a conversion from a commercial containership to a self-sustaining ammunition containership, capable of carrying 2,500 20-ft. containers. The main work package includes the installation of four new MacGregor cranes, designed to ease loading and offloading pier side and in-stream; the modification of container cell guides from 40 ft. to 20 ft., stacked from the tank top to the deck head; installation of a cargo hold cooling water spray system and cargo hold environmental control system; modifications to hatch covers, including the fitting of sockets and installation of hatch skirt landing pads; wheel shafting; and rudder and sea valve repairs. Old paint is being removed and the ship will be painted while in drydock. The ship is named in honor of Army war hero, Lt. Col. John U.D. Page, who was awarded the Medal of Honor for heroic actions from November 29 to December 10, 1950 near Chosin Reservoir, Korea. Page's mission was to establish traffic control on the main supply route to the Chosin Reservoir Plateau. Rather than leaving after completing the mission, he voluntarily stayed to help an isolated signal station cut off from the Marine division. Circle 41 on Reader Service Card Celebrity Cruises To D r y Dock M i l l e n n i um For Two W e e k s Celebrity Cruises will place its ship Millennium in dry dock for two weeks to repair an electric motor that operates one of the ship's two propulsion units. The dry dock will necessitate the cancellation of two one-week Caribbean cruises, scheduled to depart Fort Lauderdale on April 1 and 8. "Although the under-performing motor has no impact on our guests' safety or comfort, it has reduced Millennium's maximum cruising speed of 24 knots, to 20.5 knots, and has the potential to affect arrival times in certain ports of call. We want to regain that power as soon as possible and the only way to accomplish this is to undertake this repair," said Rick Sasso, president of Celebrity Cruises. The electric motor in question is housed within one of the ship's two propulsion pods.